Hi guys! I just started learning Hindi yesterday and I am REALLY struggling with the abugida, or Devanagari. As you know, there are special marks in the abugida to change the letter's end vowel. There are no explanations for the placement of the modifying marks and they just introduce the letters in the lessons. I am really struggling and I would really love to have explanations for writing in Devanagari. Guys, please help me! Are you also struggling with learning Devanagari characters? P.S. If any Indians can help me with this, I would greatly appreciate. Please write the "Tips and Notes" in the comments below. I might be able to help; I have a lot of Indians friends. I'll try to pass 'em down to ya. They don't have any explanation on where to put the marks and anything... Sorry but didn't help... Thanks anyways, here 3 lingots. What do those character mean? I really want to know what they mean in English. The chart shows vowel marks (middle column) corresponding to each vowel (left column) when they combine with a consonant (right column; with the consonant "क" (ka)). This video explains it clearly (and in a bit funny accent). Be careful while using languagereef. 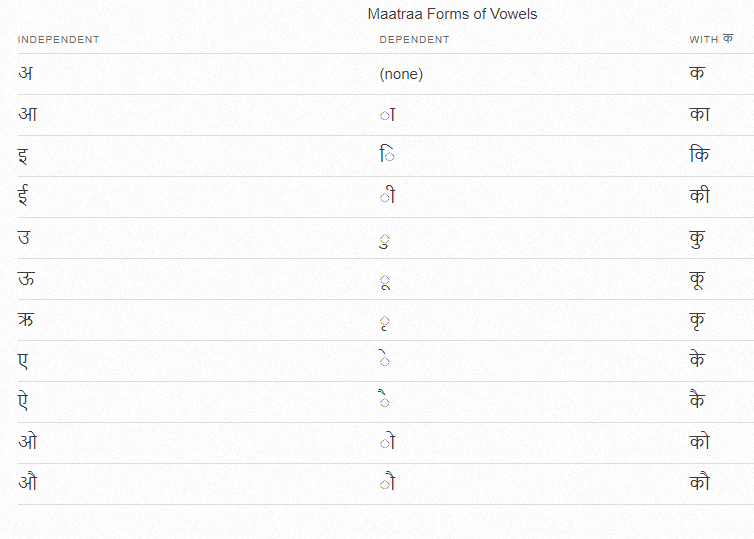 The audio for some vowels of many languages is wrong. For example, Hindi ऐ is not a diphthong like Malayalam ഐ, nor is Bangla অ pronounced the same as its Tamil counterpart அ. They seem to have used the same audio files for corresponding vowels across different languages.